All photos courtesy Kryton International Inc. While many concrete structures have a design life of 50 to 100 years, not all live up to expectations. Much of the concrete infrastructure currently in service across North America is badly in need of repair or replacement, and this premature deterioration is a large hidden cost to owners. What is causing this lack of durability? Concrete on its own is not waterproof. Normal concrete is filled with interconnected capillary pores allowing it to ‘breathe,’ but also permitting water to pass. Even high-performance concrete remains porous to a significant degree and may also be prone to cracking. Cracks are practically unavoidable in a concrete structure of any complexity. Once they form, they provide a direct path for water and contaminants to enter. Concrete structures also contain construction joints and penetrations for plumbing and electrical conduits. 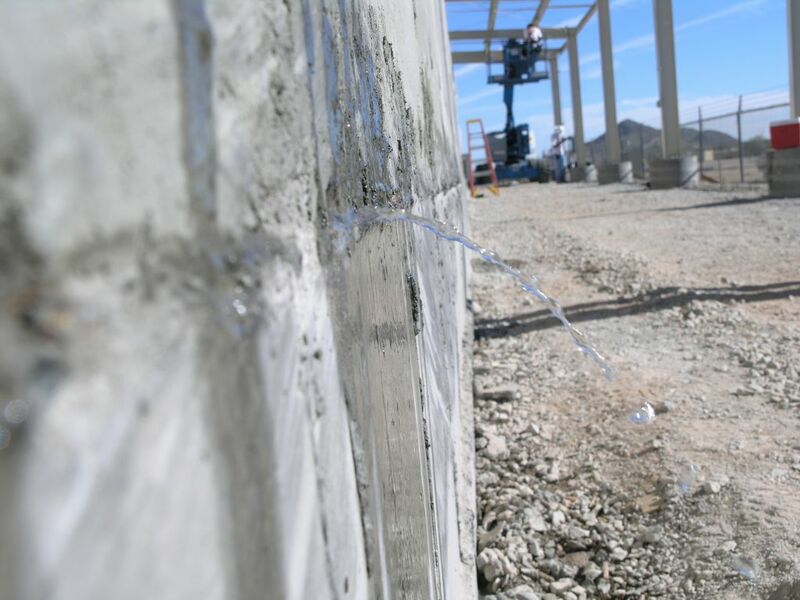 Cracks, joints, and penetrations are all areas where water can find its way into and through the concrete—especially when a head of water causes hydrostatic pressure to be exerted. As a result, if the structure is in a moist environment, especially close to salt water, deterioration can occur much sooner than expected. Most of the damage to which concrete is susceptible comes as a result of water.1 Water can erode the surface or carry chemical contaminants deep into the concrete. Contaminates, such as salt, corrode the steel reinforcement. Sulfate contaminates, alkali reactive aggregates, and water (or even water alone if it freezes) can cause disruptive expansion. When designing and building a structure, mitigating water ingress through the concrete is a critical contributor to the project’s overall integrity and durability. Vancouver’s Jameson House boasts 37 floors of glass and concrete. Designed by architects Foster + Partners, it keeps with the historic nature of the neighbourhood. Protecting concrete from water has traditionally been accomplished by separating it with a membrane of some kind. Typically, membranes are applied to the concrete’s surface either as a liquid coating or as flexible sheets joined together. These approaches have two things in common: they are only attached to the concrete’s surface, and they are easily compromised by a puncture or separated seam. To overcome this vulnerability, ways to eliminate the need for an external membrane have been explored. An option for this is to turn the concrete itself into the membrane by using a permeability-reducing admixture (PRA). Prior to the new Chapter 15, PRAs were commonly referred to as “waterproofers” or “dampproofers.” These terms have always been vague and poorly defined. The additional information now in the ACI document removes these troublesome terms and replaces them with more descriptive and useful language. crystalline materials—consisting of proprietary, reactive chemicals, they react with water to form pore-blocking crystalline deposits that resist water even under pressure. The chapter discusses suitable applications for each type, providing a wealth of information on how to properly test and evaluate a PRA to ensure it is suitable for the intended use. This information is the key to making this document useful for writing instructions and specifications. An appropriate product system cannot be specified based on the materials categories alone. Actual performance is what design professionals need to know, and this can only be determined through real-world testing or at least lab methods that closely re-create conditions experienced in the real world. permeability-reducing admixtures for hydrostatic conditions (PRAH). Concrete was the main building material used throughout the structure and an integral crystalline technology waterproofing system was specified. Approximately 13,440 kg (29,630 lb) of admixture was used. The difference between the two categories is apparent. A PRAN is intended for applications not subject to hydrostatic water pressure. Sometimes called ‘dampproofing admixtures,’ most PRANs contain water-repellant chemicals that shed water and reduce absorption into the concrete. They will not withstand high hydrostatic pressure and are better suited to applications such as concrete exposed to damp soil or rain. A PRAH is intended for use in concrete exposed to water under pressure, and is sometimes called ‘waterproofing admixtures.’ These products are able to withstand high hydrostatic pressure, and thus suitable for applications such as deep basements, tunnels, and water containment structures. Now, descriptive language is used when speaking about these special types of chemical admixtures. What are the service conditions the project will be subjected to? How is the product system compatible with the guidelines outlined in ACI 212? Have long-term tests been performed to prove the system’s effectiveness? What level of support can the manufacturer be expected to provide? Employing a permeability-reducing admixture suitable for hydrostatic conditions greatly enhances the durability of a concrete structure, but it is not enough on its own. Good mix design and inclusion of a PRA can yield watertight concrete if the goal is to create a perfect test specimen for the laboratory. However, as mentioned, actual concrete structures are complex assemblies and contain joints, penetrations, and unavoidable cracks. Workmanship plays a big role in the real world. In addition to improving the concrete’s quality, the installation also determines the structure’s durability. 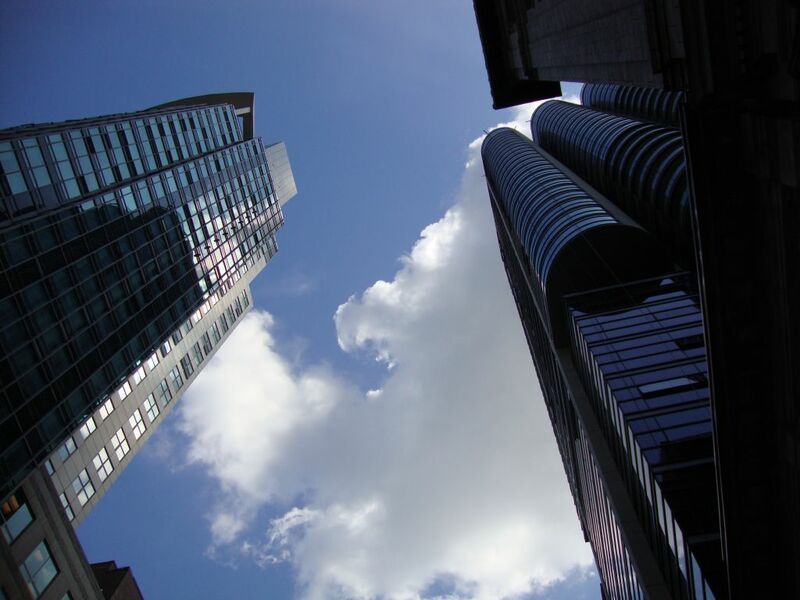 There are five important considerations that will greatly influence the long-term durability of concrete structures such as high-rise buildings, transportation tunnels, hydroelectric dams, bridges, and water/sewage treatment facilities. Construction joints in a concrete structure are unavoidable. They are also common weak points in the structure often used as entryways by water. Water penetrating through joints can deteriorate a structure in various ways; most notably by causing corrosion of the reinforcing steel. Each joint should employ a reliable waterproofing system of its own. Also, structures should be designed with adequate, pre-determined control joint locations in order to avoid random cracking. Random cracks in concrete are just unplanned joints the concrete makes for itself. Concrete must be properly placed. The concrete mix’s workability and consistency must be sufficient to place and consolidate the concrete into a solid mass, free from any voids or rock pockets. Voids most commonly occur below or behind reinforcing steel bars—especially in areas where there are many bars together. A dedication to proper vibration practices is the key to success. All concrete should be properly vibrated with special attention around congested reinforcement. The tunnel shown above is part of the penstocks that feed the B.C. Hydro power station at La Joie Dam. 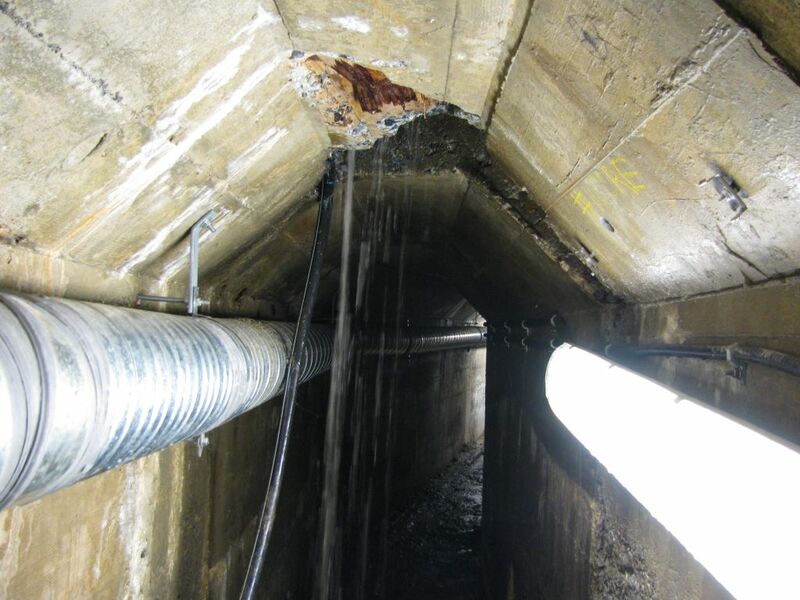 In 2009, the deterioration of the tunnel was severe and required much more than a simple crack repair for restoration. After the concrete is placed, it contains air that can cause rock pockets, honeycombing, or other defects. To mitigate these problems, the concrete must be vibrated to remove the air and consolidate the mix. Vibration is performed after concrete placement by using an internal vibration method (i.e. a special vibrating machine which is inserted vertically into the mix, then slowly withdrawn) or an external vibration method (i.e. using sanders, hammers, or other tools on the outside of the forms). Most contractors use the internal method, as it proves more effective in many situations. Rock pockets are areas where there is not enough cement paste and fine aggregate to close the space between large aggregate. There should be no standing water before concrete placement and concrete should not be moved far from where it is initially poured. Use of self-consolidating concrete (SCC) can alleviate many of these concerns. Probably the most often overlooked step in achieving durable concrete is proper curing. Curing means maintaining conditions allowing the concrete to harden and gain strength. Proper temperature and humidity are most important. The temperature should be above 10 C (50 F) for strength development to proceed at a reasonable pace. Moisture must be maintained, especially in the first few days, to promote cement hydration and keep the concrete from drying, shrinking, and cracking. Properly curing concrete will effectively pay for itself many times over by reducing permeability and increasing the material’s durability and life expectancy. Even though mix designs must change to match the conditions, low permeability is a common factor to all durable concrete. It is essential water be kept out of the concrete structure. Lower permeability can be achieved through good mix proportioning and also by reducing the amount of free water using water-reducing admixtures or plasticizers. Concrete exposed to water should also employ a permeability-reducing admixture. Creating durable concrete is not any one thing, but rather a process consisting of numerous variables. Recognizing how these variables affect other aspects of the project when selecting systems, allows for better specifications that work to increase the durability of infrastructure. 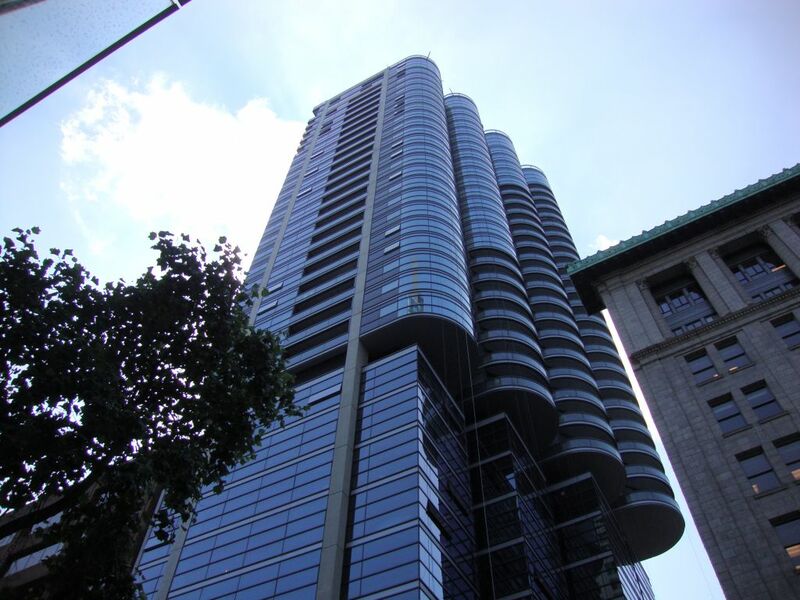 Specifications focusing on quality control at site levels, with systems offering recognized testing and thorough support throughout the building process, contribute greatly to the project’s overall success. With proper mix design, permeability reduction, and attention to good jointing, placing, and curing practices, one can create durable concrete structures that will resist the development of corrosive conditions and other deteriorating mechanisms. Kevin Yuers spent many years running a contracting company before joining Kryton International in 1994. He is the vice-president responsible for product development and technical services at the crystalline concrete waterproofing company. Yuers is an active member of several industry and business associations. He has written numerous articles and is the named inventor on patents related to the concrete industry. Yuers can be contacted by e-mail at kevin@kryton.com.